Opening the photo attachment, I sucked in my breath in anticipation. There it was, staring up at me from the computer screen in all of its jadeite glory: the green sink, the one I&apos;d been looking for everywhere. How many junk shops and salvage warehouses had I combed? How many search engines and websites had I linked my way through armed only with meager clues, stamped like glyphs inside the tank lid of the toilet in the guest bathroom: Manufactured by Standard; November 26, 1932. This tank lid was from the same guest bathroom that drew pained yelps from Greg, my husband, and I only a few months earlier. When our Realtor first showed us the stately, clinker-brick Colonial Revival house on the riverfront in Norfolk, Virginia, we simply weren&apos;t prepared for the room&apos;s startling color scheme: shocking lavender wall tiles pinstriped with glowing green—a shade paler than kelly, yet bolder than sage, and the same green as the fixtures. Under the black globs of mildewing caulk and decades of filthy soap scum, we could see that the bathtub and toilet were original. 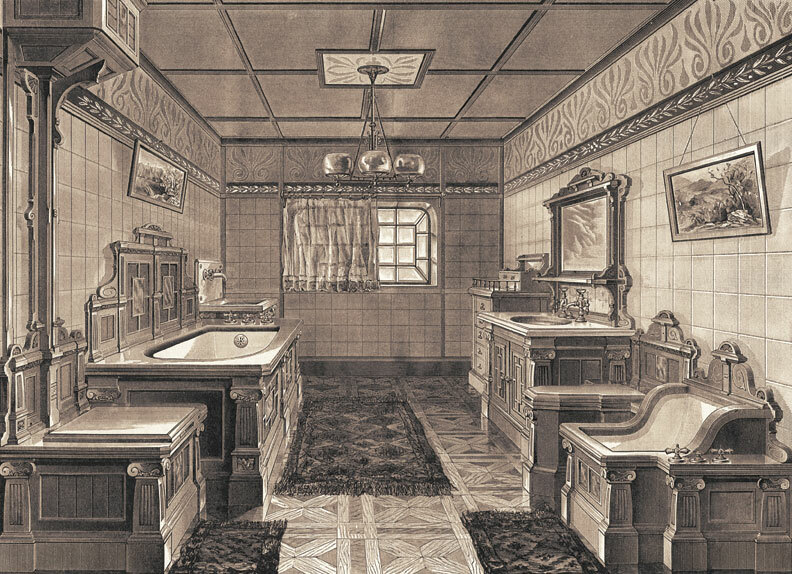 With nary a chip in its porcelain, the stalwart built-in tub was in pretty good condition. And the toilet—well, if ever a toilet could be called beautiful, this one qualified with its elegant Art Deco styling and graceful porcelain swan&apos;s neck connecting tank to bowl. But then there was the sink; cultured marble (a.k.a. plastic) on a stumpy white melamine vanity, circa 1988. Sigh. We ended up buying the house. Sure, it needed a lot of work—a whole new kitchen, a downstairs half-bath, and a front porch, for starters—but we weren&apos;t new to rehabbing. We couldn&apos;t resist the property&apos;s charms either: ornate escutcheons behind the crystal doorknobs, working transom windows over the bedroom doors, a hideaway telephone nook at the top of the stairs, rustic heart pine floors in the "maid&apos;s quarters." And boy, had we ever succumbed to that glorious water view. Nonetheless, for weeks we agonized over what to do with the guest bathroom. We were less than thrilled with its, um, invigorating palette, but neither of us had the heart to rip out original, perfectly functional appointments. Only when our four-year-old son requested a bath (actually asked to take a bath!) in "my big green tub" did we decide to make peace with the porcelain. We might not love the purple and green, but our kids sure did. That settled it; the bionic green toilet and tub would stay. As for the cultured marble sink? Now that was another matter. If we were going green, we were going green all the way. And so my search began, toilet lid in hand. The word at one salvage yard was disheartening. "Only sink ever come in here that color," announced the owner, "was one of them beauty parlor numbers with the neck dip in it." Others had green sinks galore—but in avocado and forest, emerald, and celery. Searching website after website, looking at vintage plumbing, repro plumbing, and salvage outfits from hither and yon, turned up plenty of green sinks, too—in olive and lime and chartreuse. One evening at the computer, my eyes bleary with bath fixtures, I stumbled across a promising site. Write an e-mail describing your need, it said, and it will be delivered to a network of hundreds of salvage dealers across the nation. Dare I hope? I pecked out my SOS—"sink, Standard &apos;32, funky light green"—and sent it off, and called it a night. In the morning, a reply was waiting. This may be what you&apos;re looking for, wrote Lisa in Baltimore. 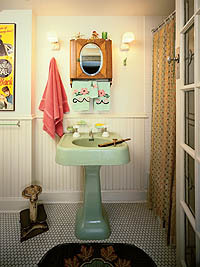 I opened the photo attachment, and there it was: an elegant pedestal lavatory with the same Deco-ish angled corners as the toilet and original chrome sunburst levers and spout, in the same luminous green. You&apos;d think I&apos;d won the PowerBall. "I FOUND THE GREEN SINK!!!!" I e-mailed my husband at work, jigging joyfully across my home office. "IT&apos;S IN BALTIMORE!!!" 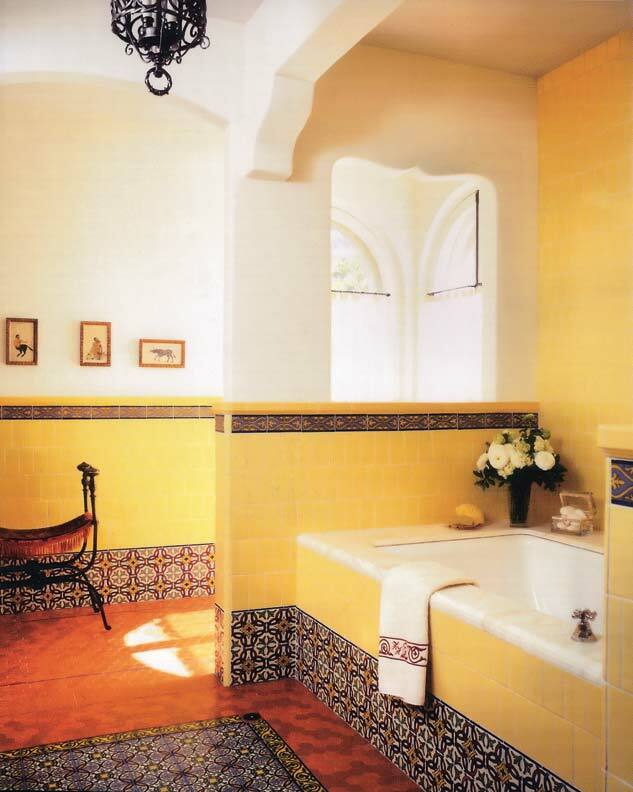 A quick four-hour drive north, and the guest bath could be restored to its former flamboyant glory. Then I got to pondering. Our master bath had suffered the same tragic fate; lovely Art Deco white toilet and tub missing their mate, original sink replaced with tacky plastic and particleboard. Wouldn&apos;t it be fabulous to find a matching sink for the master bath, too? Dare I hope again? "Lisa," I typed, "you wouldn&apos;t happen to have another sink just like the green one, only in white?" She replied within minutes. "As a matter of fact, I do. Check out the attached photo." I opened it and could hardly believe my eyes—the white sink! More jigging ensued. I dreamed some more. Greg and I had been talking about enlarging the master bath in the future. Wouldn&apos;t it be outstanding to find matching his-and-hers sinks? 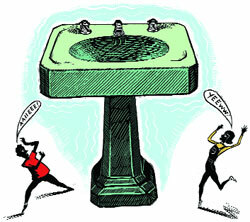 "Don&apos;t want to seem greedy, Lisa," I wrote, "but any possibility you might have another of the sinks, in white?" Hold on, wrote Lisa, let me check. She got back to us within the hour. It was a miracle; she had another one. A week later, we unloaded three vintage pedestal sinks—two white, one Ming green—from our vehicle, all lovingly swathed in padded quilts as if they were precious vases. Friends and family—well, those who&apos;ve never owned an old house—rolled their eyes at us. Me, I was thinking of Lisa, my Sink Fairy. Susan VanHecke is a journalist, author, and owner of a 1932 Colonial Revival house in Norfolk, Virginia.